Making french bread from scratch is easy and well worth the little bit of effort. This bread is great for Spaghetti, lasagna or just plain sub sandwiches. You'll find a recipe for garlic butter at the bottom of this page to turn this into some wonderful garlic bread. Put all of the ingredients into bread maker in the order recommended by the manufacturer. Turn it on to the dough cycle. On a lightly floured surface, roll the dough out into a large rectangle. Starting with the longest side, roll up tightly, press the seams together to seal and taper the ends. Place on a parchment paper and let rise in a warm place until dough has doubled (about 40 minutes). Using a knife, cut four diagonal slits across the top of the loaf. Dissolve the salt in the water. Brush the top of the loaf with the salt water. (Don't be stingy with the glaze). Bake for 20 to 25 minutes or until a light golden brown. Mix all of the ingredients together, cut the warm loaf of bread in half lengthwise. Smear with butter and close back up. Cut in serving size pieces. (If the bread has cooled, just take the already buttered loaf, wrap in aluminum foil, pop it back in a 350 degree F. oven for 6-8 minutes. 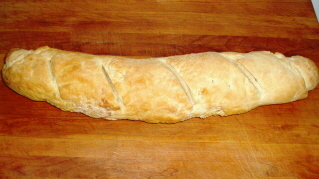 So, you see, it's not hard to make french bread with this french bread recipe!